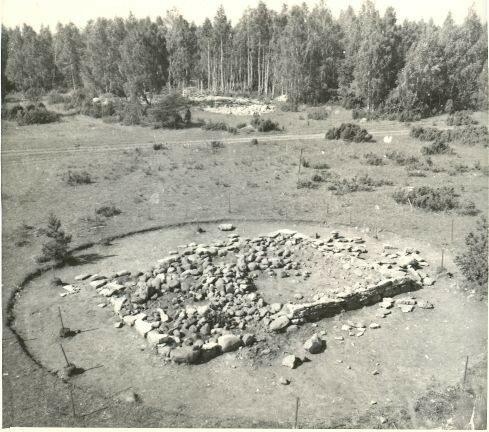 Kõmsi stone graves have been noticed already in the 1920s, but most information about the burial place was collected during archaeological excavations led by Vello Lõugas in 1970s. The tarand-graves date to 1st–2nd centuries AD. Tarand-graves are rectangular grave monuments that were used as burial places from 8th century BC until 5th century AD. The dead were either cremated or inhumed and placed either inside the rectangular tarands or outside the walls, in the ruins. The grave goods and pottery shards as well as bones were located in between the stones without any visible regularity. In Kõmsi, the grave goods included numerous pottery shards, jewellery and fragments of a single-edged sword.The grave consisting of only one tarand has been reconstructed but outlines of the larger grave consisting of multiple interconnected tarands can be traced on the ground. Kõmsi stone graves are under national protection and their registry numbers are 9862 and 9863.